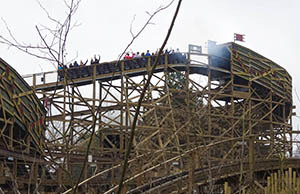 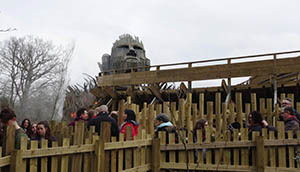 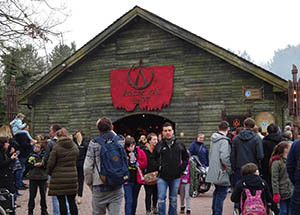 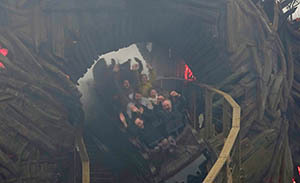 Wicker Man, the UK's first new wooden rollercoaster in 21 years, officially opened to the General Public with a Grand Opening ceremony on 24th March 2018. 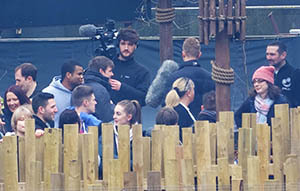 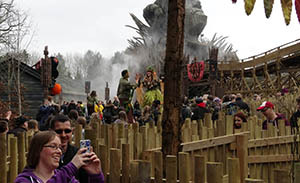 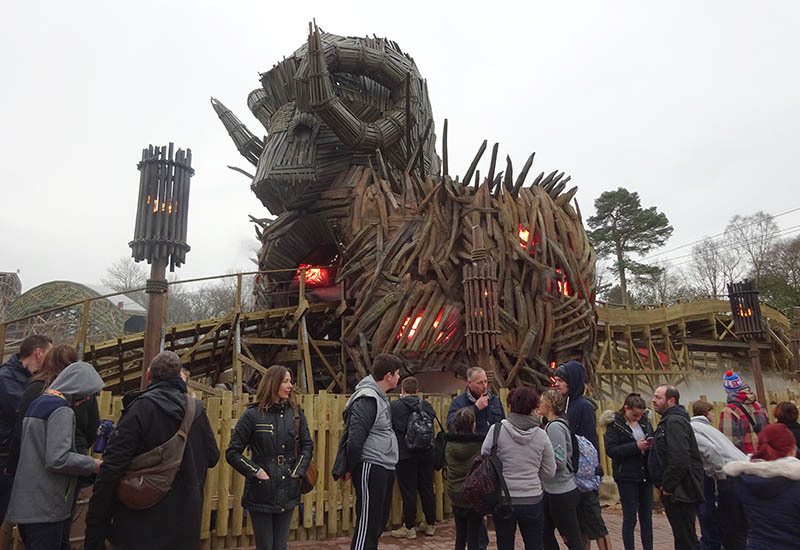 Alton Towers originally planned to open Wicker Man on 17th March 2018, the first day of the new season. 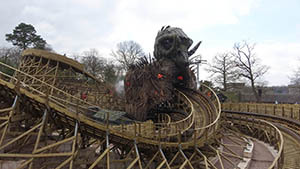 However, their plans were scuppered by a weather front known as "the mini Beast From the East", which brought snow and below zero temperatures to a distinctly un-Spring-like Staffordshire. 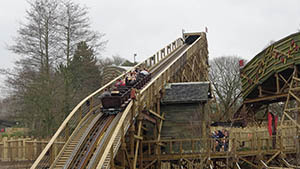 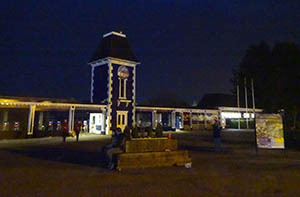 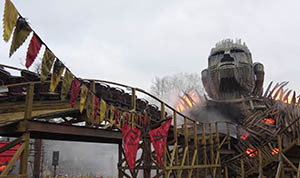 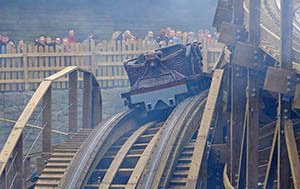 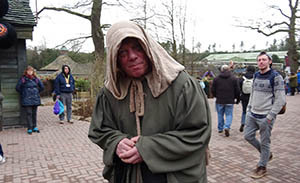 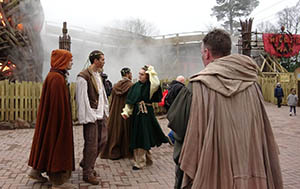 This proved too cold for any of their major rides to run, so they were forced to put back Wicker Man's Grand Opening to the following weekend, with soft openings occuring a few days before. 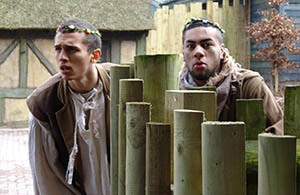 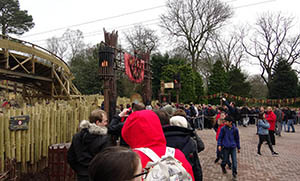 The theme park gates opened around 9:30am on 24th March, and most guests headed down Towers Street and straight towards Wicker Man. 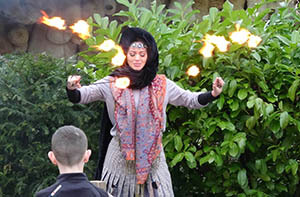 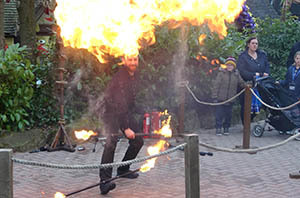 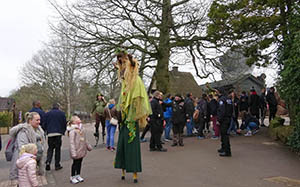 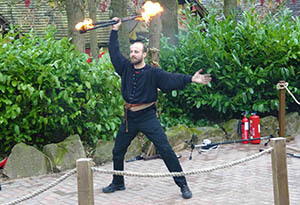 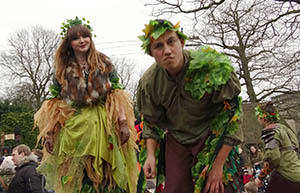 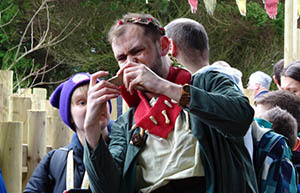 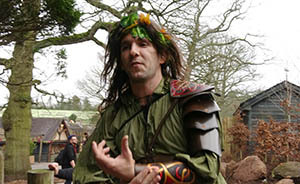 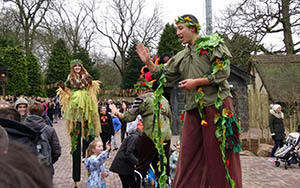 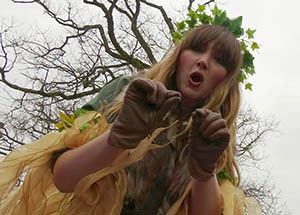 They were greeted by some of The Beornen villagers, stilt walkers and fire jugglers. 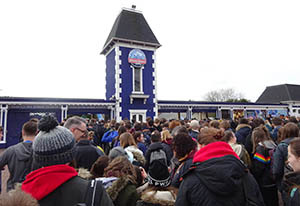 There was a bit of a delay before the ride itself opened, but within half an hour or so the first public trains were being sent around. 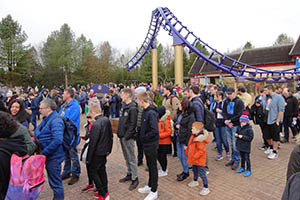 The queue quickly built up to over 3½ hours. 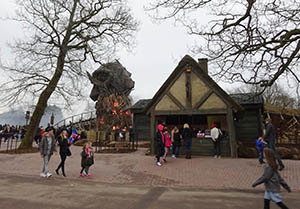 The queue was slow going, with Wicker Man appearing to be having frequent issues. 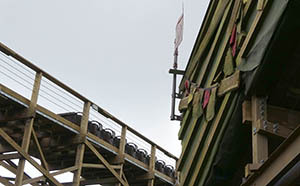 At one stage, more test trains were being sent around than trains of people - and these were only being half filled, with four rows near the back left empty on each train. 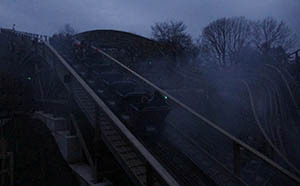 Then, empty trains kept being stopped on the lift hill. 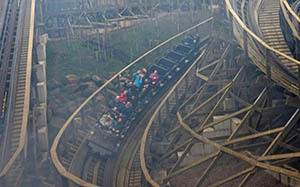 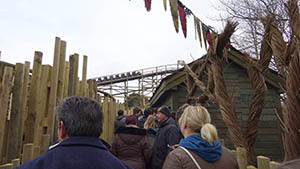 With one train on the lift hill looking as though it was not going to budge, the announcement that nobody wanted to hear was made just before 12:30 ... the queueline was being evacuated. 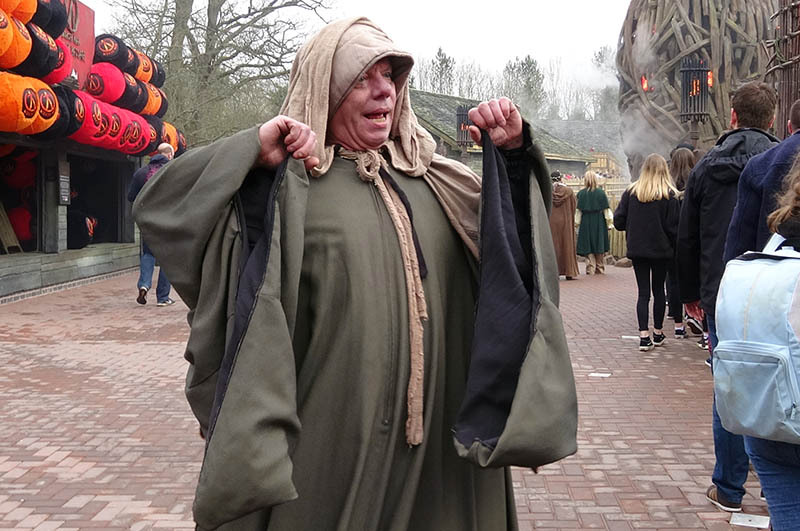 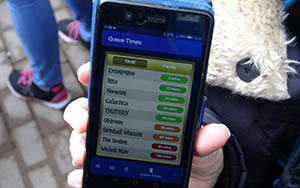 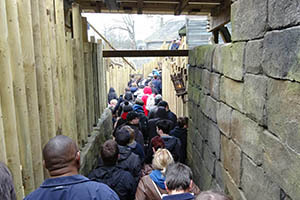 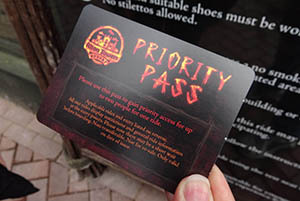 With most people having waited over two hours, there were a lot of disappointed faces, but staff were on hand to give out Priority Passes so guests could shortcut the queue on Wicker Man or another ride later in the day. 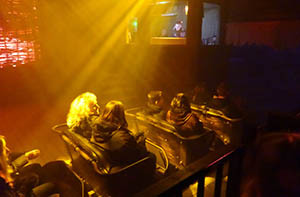 The park closed at 6pm, and at 7:30pm the ride was still churning through people. 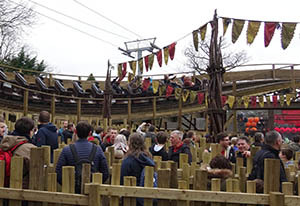 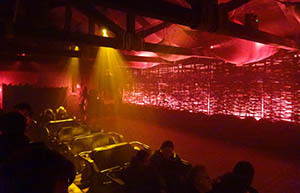 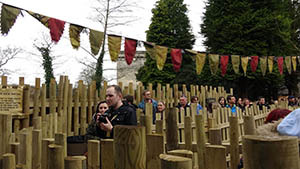 Reactions were extremely positive - even despite the teething problems, guests were all very complementary and standing around raving about the ride. 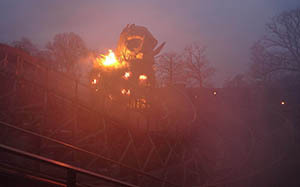 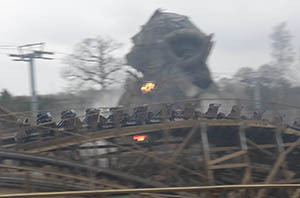 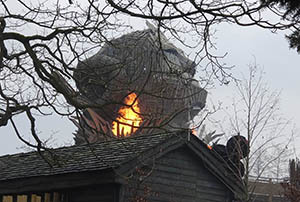 With flames leaping into the night sky from the giant Wicker Man statue, it seems that Alton Towers' gamble building a new wooden rollercoaster is going to pay off! 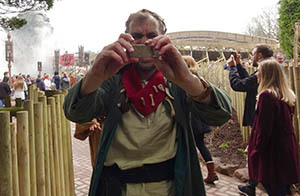 I got my photo taken ... with a stone??? 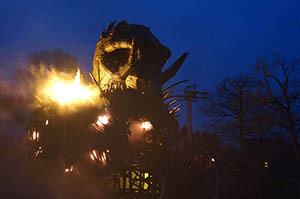 Did you know, Wicker Man features a lot of fire?